Sitting on my lap, playing with fabric, stitches and cotton stuffing. Sock I am knitting very slowly. 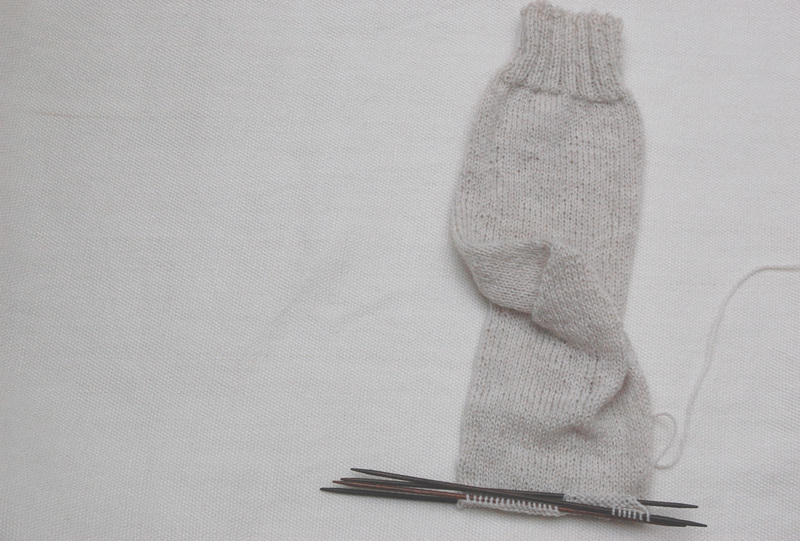 Categories: knitting, sewing, socks | Permalink. Last night I finished sewing a toddler size jumper in Liberty of London kingly cord. (Love the weight and texture of this fabric!) I’m also close to binding off on a matching sweater. It feels great to be making things again! Over the summer days and months went by without the click of needles. Piles of fabric went untouched. Weaving shuttles gathered dust. It made me realize that I simply cannot go without making something for very long. My aunt recently told me that my grandmother was always working on a project. Always had knitting or needlework in a basket by her chair. She would know how I feel today. A sense of balance returned through handwork. Categories: knitting, sewing | Permalink. Some new fabric –nani iro linen gauze– I love rolling up fabrics and tying them with string. A new hat in swans island worsted for a toddler. Finally used the pom pom maker I bought before Christmas – didn’t know what I was missing!